Honoring your parents doesn’t end when you have grown up and moved out of the house. You (we, all of us) are called to honor your parents throughout their lives. Of course, there are always circumstances where we are not able to obey this verse (parents leave this earth, are abusive, abandon their children, etc. ), but where possible we are called to honor them. Not sure how? 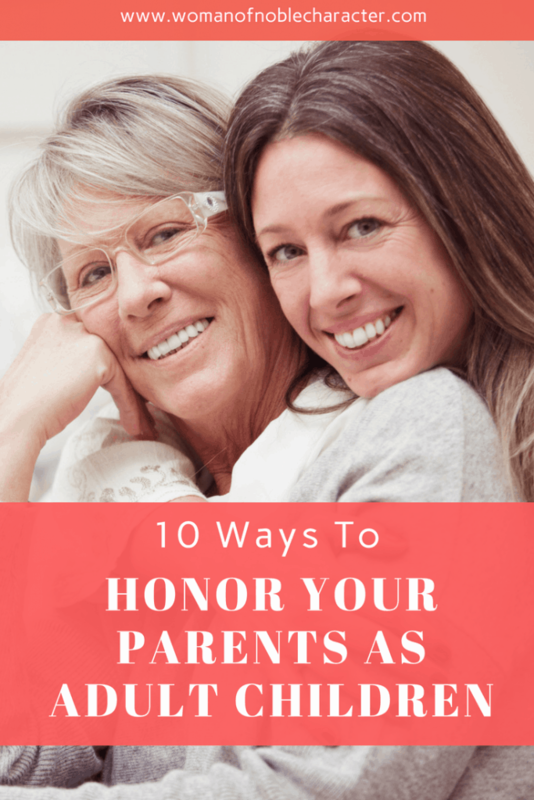 Here are ten ways to honor your parents. When we enter this world from our mother’s wombs, we are pretty helpless. We haven’t learned yet to feed ourselves, walk, communicate or do any form of self-care (um, change our diapers!). Our parents take on all of these responsibilities. We may drive them crazy as we grow up, but they continue to put clothes on our backs, provide food and run us from practice to youth group (if you were raised in a Christian home) and so much more. Even if your parents were (are) unbelievers, they have still raised us and deserve our gratitude. To honor your parents begins by being thankful for them. Almost daily, we see stories in the news of abusive parents or parents killing their children. If you still on this side of the earth, your parents did at least a few things right. Abuse is never OK and there will always be situations where adult children need to separate themselves from their parents, but even if gratitude feels impossible, as Christians we are to be thankful even in dark circumstances as God uses those circumstances for His good. There are numerous verses in the Bible about communication and the importance of it in building relationships. God wants us to have deep relationships with others and your first relationships are the ones with the parents that He has placed in your life. God chose your parents just for you and building (or mending) that relationship is important to Him. To honor your parents, you need to talk to them. Ask about their day, how they are doing. Ask questions about when they were growing up. Learn about the milestones in their lives and what you have in common. 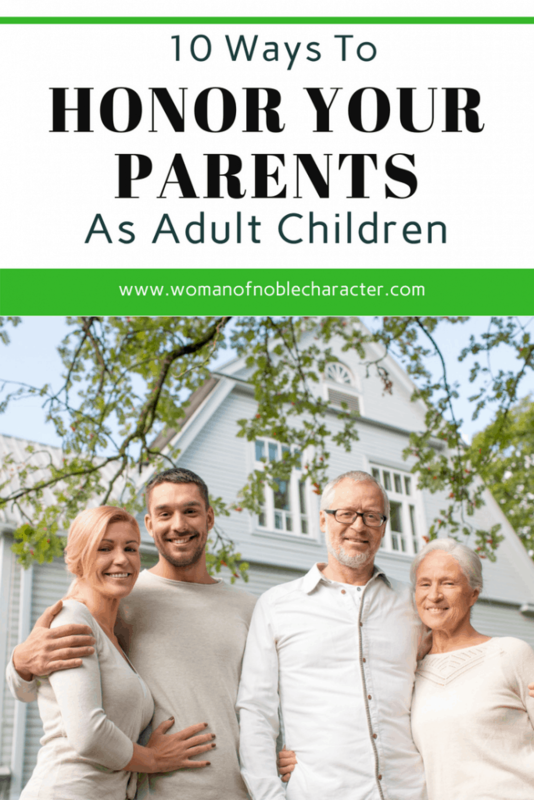 Often, weeks or even months go by without someone talking to their parents, but the Bible makes it clear that Christians are to handle this differently. In 1 Timothy 5:8, we read “Anyone who does not provide for their relatives, and especially for their own household, has denied the faith and is worse than an unbeliever.” To honor your parents, you need to talk with them. A visit, a phone call – no matter how busy you are. That visit or call may be the highlight of their week. 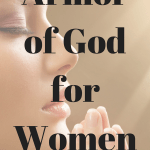 In Ephesians 6:2 (“Honor your father and mother”—which is the first commandment with a promise—), the word for honor (τίμα) is translated to mean to determine the value of something. The value of our parents is incalculable. In this verse, Paul reminds us that the commandment is to honor our parents and to see them as valuable. We are not honoring our parents if we are short with them, show irritation or use unkind words. How we talk to others is a reflection of how we feel about them. In Matthew 12:34, Jesus says “You brood of vipers, how can you who are evil say anything good? For the mouth speaks what the heart is full of.”. To honor your parents, your words should honor them as well as your actions. When I look back at some of the things that I said to my mother when I was a teenager, I cringe and ask God for forgiveness. Teenage girls can be volatile and wretched to their mothers. I know that, at time, I sure was. Thankfully, God put me on the right path as an adult and we enjoyed a strong relationship before she went into Our Father’s arms in 1999. When we show resentment or frustration towards our parents, we are reflecting a heart that is not grateful. In addition, we are sinning by not giving our parents the position of authority and respect that God has ordained. We need to treat them, in speech and deed, as some of the most important people on earth. In point two, above, we discussed the importance of talking to your parents. While you’re talking with them, ask for their advice. Not only will they be pleased that you trusting them to share their wisdom, but they will most likely give good advice. They watched you grow, nurtured you and probably know you in ways that no one else does. It should go without saying, but if your parents are not believers, you should avoid asking them for spiritual advice. Another way to honor your parents is to pray for them. Pray for their health, relationships, vocation, if they are still working. Pray for their walk with God (or for their salvation if they are not believers). Additionally, if you struggle with how to honor your parents, ask God to help you in this area. As we go through the daily trials of life, we sometimes forget that our parents are going through difficulties, as well. There are financial struggles, health issues, friends and loved ones passing away and more. There is no end to the list of ways that we can pray for our parents. Praying for your parents is a way to honor your parents. In the above section, we were reminded of how difficult aging can be. Encouraging your parents in their later years is a beautiful way to honor your parent. Encourage them to share their wisdom or to disciple the younger men and women as they find more time on their hands during retirement. “not giving up meeting together, as some are in the habit of doing, but encouraging one another—and all the more as you see the Day approaching.”. While the verse does not specify if “the day” is the Lord’s return or their own death, Paul is reminding us that we need to encourage our elders and friends as time goes on. If your parents do not have a relationship with our Savior, you should be encouraging them to repent and give their lives to Christ. One of the most important ways that you can honor your parents is to forgive them. Every parent makes mistakes in raising their children. I know that I have made my fair share of mistakes in raising my own children. No parent is perfect. All have made poor decisions at one time or another or have said or done things which have hurt us. Let go of any bitterness or resentment and forgive them. If you are unable to forgive, you (and your parents) are unable to move forward. You will be stuck in the mire of anger and resentment, which is unhealthy for both of you. You can honor your parents by extending grace and forgiveness to them. So much of how we deal with and honor our parents comes down to pride. 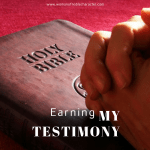 We have seen the worst of them and have seen them sin towards others and towards us.The Bible, however, is very clear that the way we treat our parents has significant consequences, not only for our life on earth,but our spiritual life, as well. 8. Tell them the truth. Lying to one’s parents has been going on since Adam and Eve started a family. It’s both amazing and sad to know how many children lie to their parents. Perhaps because the children (even as adults) fear the consequences or perhaps they simply don’t want to disappoint their parents. As uncomfortable as it may be to tell them the truth, it is extremely important that children never lie to their parents. Relationships cannot thrive if they are built on a bed of lies. If you have lied to your parents confess the truth to them and ask them to forgive you. There are few things that can honor your parents more than telling them the truth. In Mark 7:9-13 Jesus deals a strong rebuke of the Pharisees. He accuses them of using their religion as an excuse for not taking care of their parents. In fact Jesus will accuse them over and over of setting up a religion that hurts the elderly, especially widows. Paul maintains that we are worse than an unbeliever when we do not take care of our parents. Taking care of your parents can be as simple as driving or accompanying them to Dr. appointments or helping them pay their bills. As our parents age, sadly there are those that look for every opportunity to take advantage of them. The Investigation Discovery channel has aired numerous programs on children stealing from or murdering their parents for money – and that’s just in the family! If you are currently helping your parents, know this: the Lord is pleased with you and you are a great example to those around you (especially YOUR children who one day may need to take care of you). Finally, you can honor your parents by how you speak of them privately and to others. We can give such high regard in a one-on-one conversation or or in how we talk about our parents to others. Consider writing a formal tribute to your parents and read it aloud for them. Can you imagine the impact that would have on your parents? What greater joy could there be for a parent than to hear your gratitude and love? 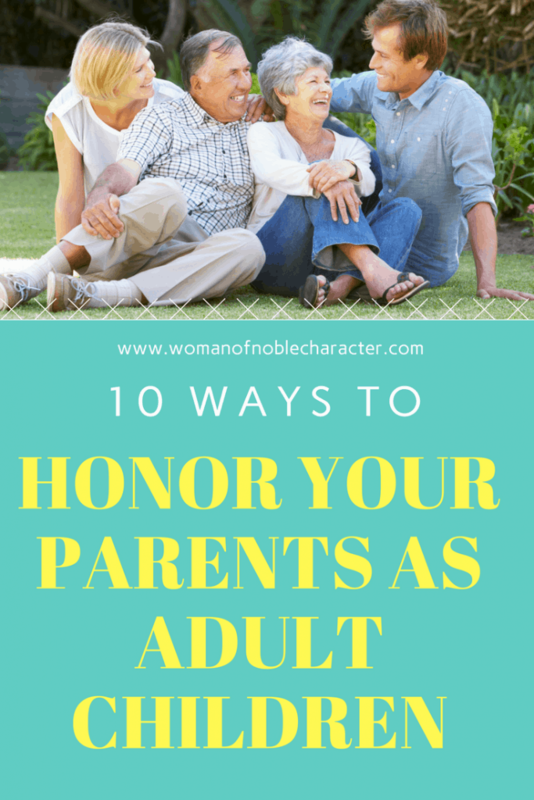 How do you honor your parents? What would you add to this list? 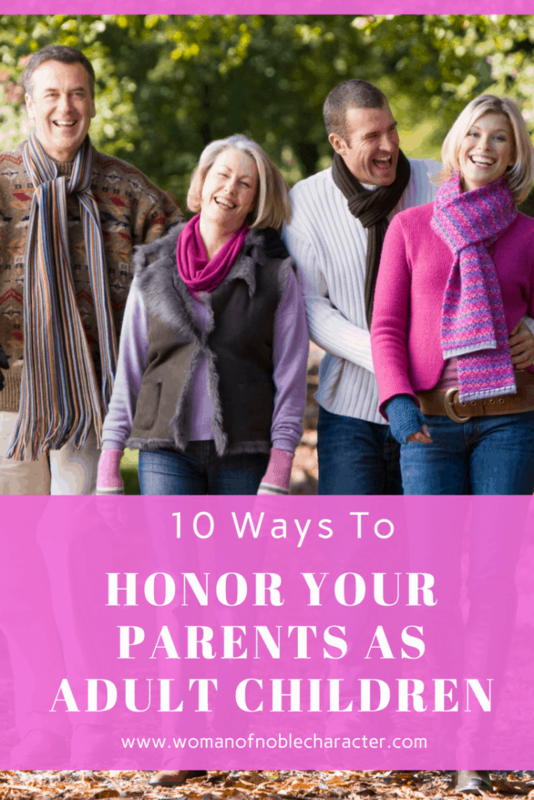 What areas do you need to work on to better honor your parents? 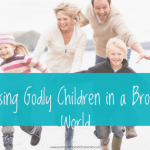 Did you miss Raising Godly Children in a Broken World? Check it out HERE. This is really good advice. Definitely something to take note of and put into practice. It’s so easy to overlook some of these things and take our parents for granted. Thanks for posting this. yes! 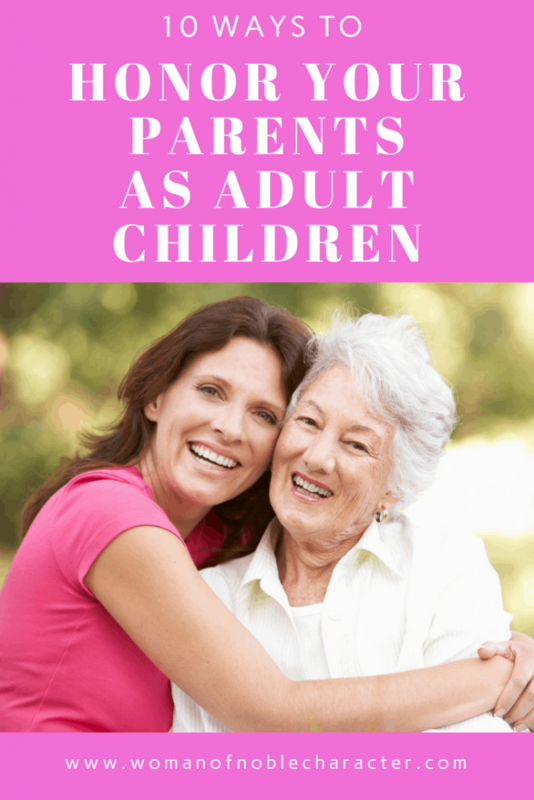 Even as adults – maybe especially as adults, we need to respect and love our parents. Thanks so much for stopping by! Oh. My. Just…yes and amen! A very needed post for today’s culture. Thank you! You are very welcome! It’s so important to respect and honor our parents as adults. Thank you for stopping by!